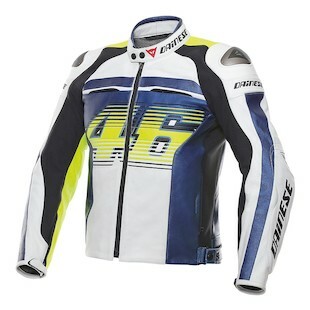 Dainese VR46 D1 Leather Jacket: Calling The Dr.
Much like our favorite Doctor (sorry, Who), Dainese continues to surprise. With the new Dainese VR46 D1 Jacket, they have created a technical race leather with all the Rossi livery you can stomach. Half Racing C2 and half Racing D1, the VR46 D1 puts the old and new into a blender (along with Yamaha blue and hi-viz yellow) and spits out a Jackson Pollock painting of sleek Italian sexiness. The overall chassis is much like the old Racing, with a snap waist adjuster, two chest vents, and micro elastication on the elbows. Co-injected shoulders live amongst a 3D bubble liner and a pocket for Dainese’s chest protector. S1 stretch paneling on the lats and back of shoulders ad a bit more comfort, which is paramount if you plan on emulating Mr. Rossi on the racetrack (don’t try too hard). For the hotter days, or riders who make their way in warmer climates, the Dainese VR46 D1 Perforated Leather Jacket is the one to consider. With all of the great features of the standard, this jacket will allow more air to get to you underneath and keep you as cool as Rossi at the starting line. Dainese’s slew of standard features are accounted for, with a Sanitized lining, reflective inserts, jacket / trousers fastening system, and a pocket for the new Manis back protector all coming stock. It’s a little new and a little old and a whole lotta Doctor.